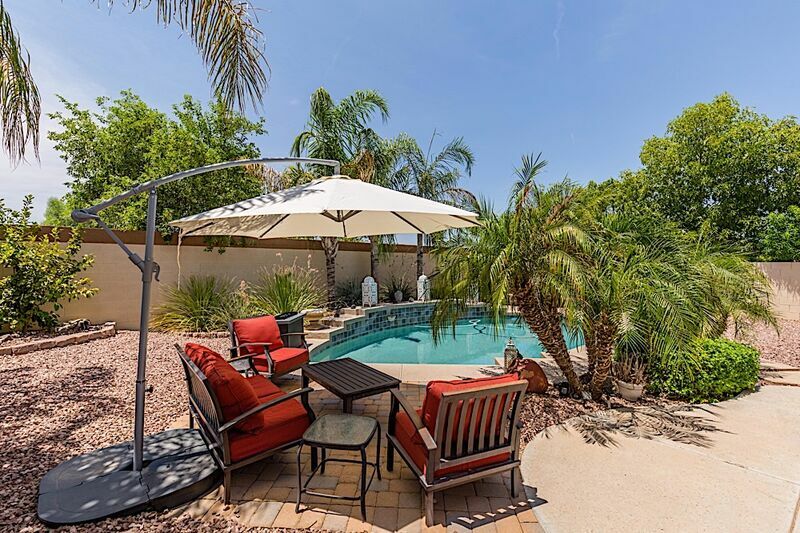 Welcome to the All Star Chandler home located just 4 miles South of the 202 freeway off Gilbert Road. This beautiful and booming area has an abundance of shopping, fine dining, endless green belts and beautiful parks. You will find nearby golf courses, MLB Spring training facilities, Wild Horse Pass casino and many nearby seasonal festivals as the major Chandler attractions. This beautiful home was just remodeled and renovated with all new furnishings and decor. Walking through the front door you will be greeted by a beautiful kitchen with sand painted walls, granite counter tops, maple cabinetry, black on black appliances and three pendant lamps hung from above to illuminate the breakfast bar. The dining room is lighted with a wrought iron chandelier and has been furnished with a round beveled glass table and four black leather chairs. Beautiful tiled floors complete the entry of the home and then transition into brand new dark mahogany wood flooring in the family room. The family room is beautifully furnished with a dark chocolate leather sofa, matching love seat, a lighted console stand, coffee table, upholstered arm chair and a matching entertainment center. The entertainment center houses a 50" flat screen TV, DVD player and Cox cable box. A sliding glass door off the family room leads out to the covered patio and backyard. The Master bedroom has been tastefully furnished with a Queen size cherry wood bed, duvet styled tapestry bedding, two lighted nightstands and a large dresser with a 32" flat screen TV. The Bay window has an upholstered bench which is illuminated with natural sunlight during the day and looks out to the resort style backyard. The en suite Master bathroom has a double mirrored sink granite vanity, a walk in glass door shower, separate soaking tub and a large walk-in closet with a mirrored door. The second guest bedroom has olive painted walls, a birch wood four poster Queen size bed with bright white floral accented duvet style bedding, two lighted nightstands, a large dresser to store your clothing with a 32" flat screen TV on top, and a sliding door closet with plenty of room to hang your clothing. The hall bathroom right next door has a single mirrored sink vanity with a walk-in tub / shower combo and commode. The third guest bedroom has maple wood flooring with two twin beds, a TV, and plentiful closet space. The resort style backyard features a covered Ramada which is beautifully furnished with a love seat and two chairs with bright red seat cushions. You will also find a brand new stainless steel grill, a ceiling fan for those warmer evenings and a table with citronella lanterns. Beautiful complimenting pots and decorative lighted lanterns surround the pool and give a wonderful finished touch to the backyard decor. The beautiful heated pool has four bright red chaise loungers with a matching red umbrella on each side. (**A daily pool heat cost will apply, ask your agent for details.) You will not be disappointed with all the care and attention to detail provide in this wonderful All Star Chandler home. The All Star home comes complete with high speed wireless internet, cable TV, a full size washer / dryer, ceiling fans throughout and an attached two car garage for guest use. Book your stay now in this beautiful home away from home. All Star was a great vacation rental. There were some issues with minor things like not enough flatware and certain appliances in the kitchen, and a few broken items in the home (vertical blinds in the living room and ice maker in the kitchen), however, your property services staff and Gilbert and Todd in particular dealt with every item we called about in a timely and pleasant manner. We love Signature Vacation Rentals because of your great customer service.